Currently, the 46.6 km Western High Speed Diameter is the largest infrastructure project in St. Petersburg, Russia. The highway will create a quick connection between the northern and southern parts of the city and the Vasilievsky Island and improve traffic conditions. 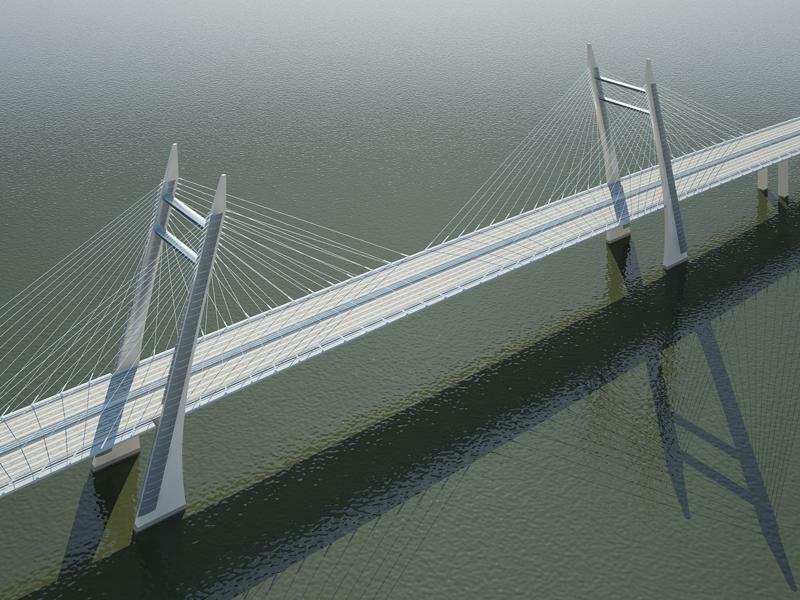 At the centre of the project is the 620 m long bridge across the Korabelny channel. 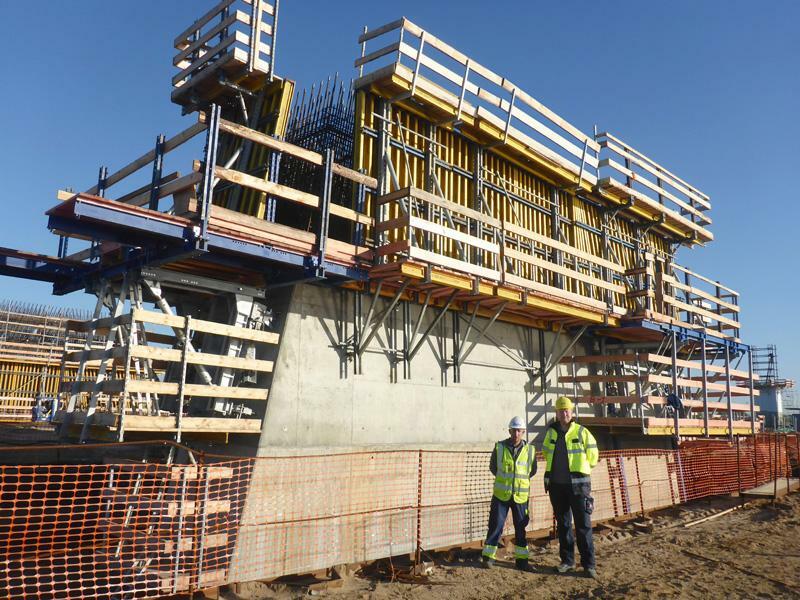 Doka is the supplier of an efficient and easily adaptable formwork solution for constructing both pylons and main piers. The centre section of the Western High Speed Diameter (WHSD) measures 11.5 km and is the most difficult section of the infrastructure initiative: 7 km of it run across the Gulf of Finland. 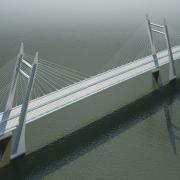 The topography requires construction of a flyover, a tunnel and three bridges. The cable-stayed bridge across the Korabelny Channel measures a total of 620 m with a 320 m span between the pylons. These are inclined at 12 degrees from the vertical and are 125 m high overall; the concrete structure measures 99 m and is topped by a steel structure. The bridge superstructure is implemented as a steel structure. For constructing the pylons and the main piers, ICA Astaldi – IC Ictas – WHSD realizing the project relies on Doka’s expertise. In cooperation with the St. Petersburg branch, the Competence Center Bridges at Doka Headquarters delivered a high-performing solution that combines crane-lifted and automatic climbing formwork for the pylons with their sophisticated shapes. The combination of crane-lifted Climbing formwork MF240 and Automatic climbing formwork SKE plus reduces modification times and therefore construction costs in the first eight casting sections. SKE50 plus and SKE100 plus provide the solution in the typical zones of the pylons. The cross-sectional area tapers from 63 m2 to 18 m2. 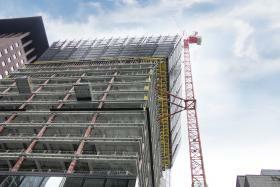 In combination with telescoping platforms, the formwork quickly adapts to the taper of the pylons. The forming operations started in July 2014. With its modular design concept, the Automatic climbing formwork SKE plus provides an efficient solution for the pylons. The system climbs independent of a crane from the very first casting section. At the push of a button, the radio remote-controlled hydraulic equipment enables simultaneous repositioning of all climbing units. The telescope function is ideal for quickly adapting formwork to cross-section changes without major modification work. 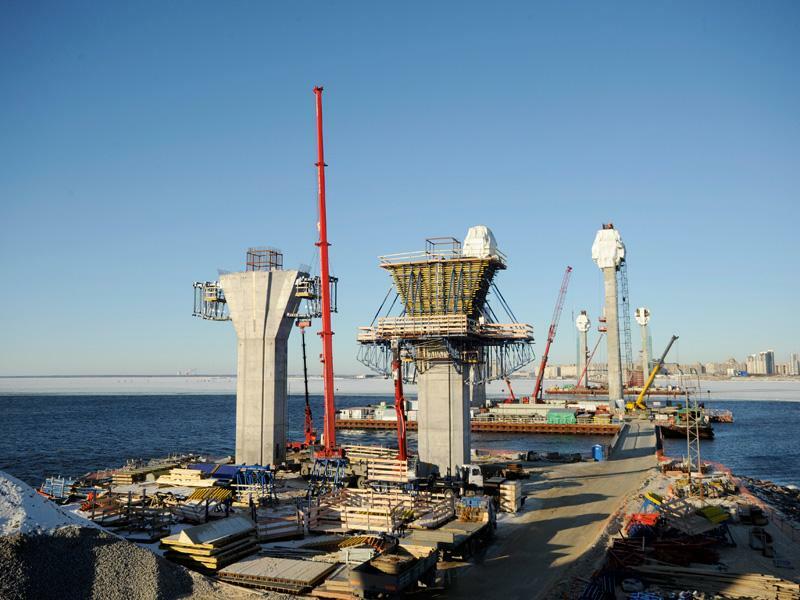 While the piers are built with the Climbing formwork MF240, the pier heads presented a particular challenge for the project team. For the first time the experts of the Competence Center Bridges put into action the Heavy-duty bracket HDC that was tailored to the project-specific requirements. The system has an especially high load capacity, it is modular and versatile in its use. A total of 1,000 kN can be transferred by one heavy-duty bracket compared to 310 kN when using conventional Supporting construction frames. With a suspension shoe, the brackets can be used for structure inclinations up to 22 degrees. Short modification times and quick casting processes reflect customer requirements. The bracket is 4 m long and, if necessary, can be extended by using Supporting construction frames. The Heavy-duty bracket HDC used for the Korabelny Bridge measures a total of 12 m.
Halfen tie rods used to screw on the suspension shoe for the bracket are embedded in the last casting section of the pier shaft. Two brackets, each consisting of a basic and attachable frame, are connected by horizontal and diagonal bracing. They are hung into the suspension shoes and secured as a pair of brackets. The entire unit, including the mounted formwork, can be levelled with a hydraulic cylinder. The total lift enabled by the lock nut cylinder is 100 mm. An upward adjustment of 20 mm is possible, while the bracket can be lowered up to 80 mm during stripping. Spindles at the bottom of the entire frame ensure that loads are transferred into the pier. The Heavy-duty bracket HDC debuted in December 2014. 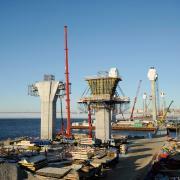 A total of 500 m2 formwork is used for the pier heads. With its Formwork planning for the automatic climbing technology and development of the Heavy-duty bracket HDC for the pier heads, the Competence Center Bridges once again demonstrates its skills in managing structures with sophisticated shapes. In September 2014 Pylon Project Manager Markus Kamleithner oversaw the first climbing process in St Petersburg: “For the project, we redesigned the telescope-solution of the platforms. In order to respond immediately in the event of any questions, it was essential to be present on site. 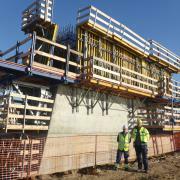 Fortunately everything worked out.” Since June 2014 Doka's on-site Formwork instructor Georg Glösmann has been ensuring that formwork systems are properly installed and handled. The formwork solution also meets the high safety requirements on the site. The Automatic climbing formwork SKE plus is equipped with wide working platforms and ensures quick and safe operations. A cover on all platform levels provides protection against wind and weather. Thank you for your interest - Premiere: Heavy-duty bracket HDC for pier heads. Thank you very much for your interest - Premiere: Heavy-duty bracket HDC for pier heads.